USPA NEWS - From April 1, TEF CEO, Parminder Vir will officially become a member of the TEF Advisory Board. Ifeyinwa Ugochukwu resumes as the CEO of the Foundation. 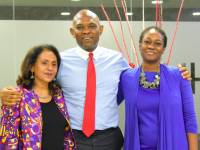 Parminder Vir was the Chief Executive Officer of the Tony Elumelu Foundation (TEF).